Fully automatic, on screen calculation based on the delivered date. Automatic Data capture, storage and graphic display. Recording, storage and retrival of results and details. Built in facility for printing of test results and the graph. Load measurement by load cell. Over Load and Over travel safety. On line display of Load, Elongation and Graph. Tare load and reset elongation facilities available. Fully automatic on screen calculation like UTS,Y.S, Proof stress, etc. It is possible to use a number of load cells, say two or three, to cover much wider range of load, to suit the application. Cost of one load cell is included in the price, but additional load cell will be at extra cost. Standard load resolution is with 10000 counts. Finer resolution (Optional) with 20000 counts can also be offered at extra cost. Standard displacement resolution is 0.1 mm. Types of tests, testing materials, grips, attachments, fixtures, straining speed as like Analogue version, Model: TKG. Various Models - Maximum Capacity from 200 N to 50 kN. § Tensile Testers conforming to following standards i.e. IS,BS, ASTM, DIN or ISO are now available for Automotive, Textile, Paper,Steel, Food & Packaging. Aero Space & Defense, Wire & Cable Industries, etc. § Suitable for testing a wide range of materials like rubber, wood, plywood, plastic, rexins, ceramics, Teflon, cardboard, latex, composites, ferrous metals, non-ferrous metals,etc. of various forms like round , flat, thread, wires, dumbbells, fabric, belts, strips, ropes, etc. § Variety of tests like Tension, Compression, Cross breaking / Bending, Shear, Linear Bonding / Gripping / Peeling strength of adhesives & tapes, etc. are conducted. § Wide range of Grips, Attachments & Special fixtures are available to suit variety of material and shapes. Loading Accuracy ± 1% confirming to IS-1828-1991. Simplified design for ease of operation and maintenance. Safety provisions against over load and over travel. Motor driven crosshead for easy adjustment facilities rapid fixing of test specimen. Straining at variable speeds to suit wide range of materials. 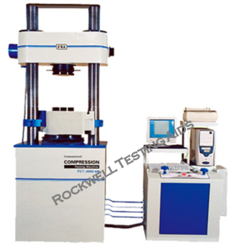 Compression Testing Machine have a wide range of applications. 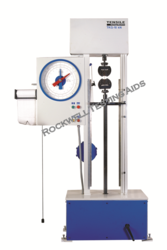 It is designed to check materials under compression, ending, Transverse, Brinell Hardness & Shear testing etc. The machine consists of 2 units viz. loading unit and control panel.